Olympus claims that its first Micro Four Thirds camera, the 'retro-style' E-P1, will rewrite the history books when it arrives in the UK next month. Olympus claims that its first Micro Four Thirds camera, the ‘retro-style’ E-P1, will rewrite the history books when it arrives in the UK next month. 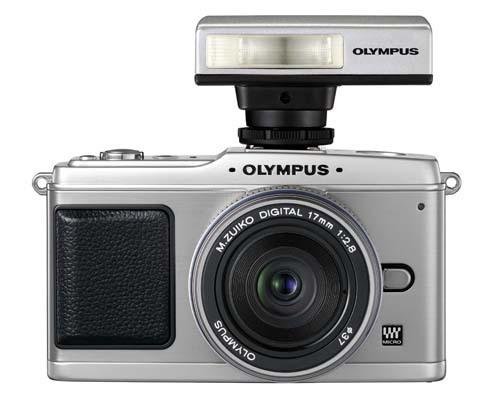 Combining the ‘timeless style’ of the classis Olympus Pen series with the ‘mirror-less’ build of the new Micro Four Thirds digital format, the much-hyped Live View camera boasts an effective resolution of 12.3-million-pixels. While some traditionalists may baulk at the absence of an optical viewfinder and built-in flash, Olympus is keen to stress that both these features are available as optional accessories. The hotshoe will accept external units from Olympus’s E-system flash range, as well as a new (FL-14) flashgun that coincides with the E-P1 launch. Equivalent ISO sensitivity can be expanded up to ISO 6400, claims the firm. Touted as a ‘perfect marriage of simplicity, style and performance’ the E-P1 features ‘HD’ (1280×720 pixel) video recording. Out in a choice of silver or white colour options, the E-P1 is expected to cost around £700 with a new 14-42mm f/3.5 lens. It will also be available in the UK with a 17mm f/2.8 pancake lens, and as a twin lens kit. 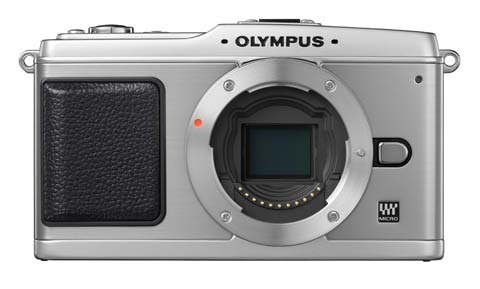 Encased in an aluminium and stainless steel body the E-P1 uses a 12.3MP Live MOS imaging sensor and a new imaging processor called Truepic V.
An Olympus UK spokesman declined to reveal the name of the imaging sensor manufacturer. Technology borrowed from the firm’s DSLRs includes six Art Filters: Pop Art, Pin Hole, Soft Focus, Pale & Light Colour, Light Tone and Grainy Film. Additional firepower comes in the form of face detection, Shadow Adjustment Technology and image aspect ratios including 16:9. Claimed to deliver ‘DSLR quality in compact form’ the E-P1 boasts built-in image stabilisation, Supersonic Wave Filter dust reduction and a top shutter speed of 1/4000sec. Exposure compensation of plus or minus 3EV in 1/3, 1/2 or 1EV steps is possible, as is simultaneous raw and JPEG file recording. The SD-card compatible newcomer sports a 3in LCD screen (230,000 dots), a ‘level gauge’, multiple exposure and a burst rate of three frames per second up to a maximum of 14 raw format files. Powered by a Li-ion battery it incorporates an 11-point AF system, as well as aperture and shutter priority and full manual exposure control. Filter effects will include yellow, orange and red, while auto gradation adjustment is designed to prevent ‘blown highlights and blocked-in shadows’. The camera measures 120.6×69.9×36.4mm (excluding protrusions) and weighs 335g (body only). Optional accessories will include an external viewfinder (VF-1) and a leather camera case. Ahead of its official debut, the EP-1 will go on show at the Jessops store in New Oxford Street, London on 25 June. The E-P1 will be launched alongside the first Olympus Micro Four Thirds lenses: the M. Zuiko Digital 17mm f/2.8 Pancake and the M. Zuiko Digital ED 14-42mm f/3.5-5.6. They deliver the 35mm equivalent of a 34mm and 28-84mm lens respectively. The 17mm pancake lens has a six-element-in-four groups build and contains an aspherical lens. Measuring 57x22mm it features five blades and has a filter size of 37mm. Meanwhile, the 14-42mm features nine elements in eight groups and boasts two aspherical elements. The 150g lens has a close focusing distance of 0.25m and measures 62×43.5mm. Both lenses will be available as kits with the E-P1 camera body. The E-P1 is also compatible with existing Four Thirds lenses, and OM lenses, via an optional adapter.